Hello... and welcome to the Stragglists' road cycling page. To see the weekly blog, click here. To link to the Stragglist Flickr group, click here. It goes without saying that amongst the hundreds of Stragglers there was going to be a proportion of members who wanted to diversify their training by occasionally pursuing an alternative discipline. Cycling fits the criteria for a runner perfectly, whether it be because of a running injury, creaky joints, cross training for tri or duathlons or, like me, wanting to do something other than the usual ten mile Sunday run. I was bitten by the cycling bug about five years ago after watching the Tour de France for the first time and I realised that quite a few Straggler members, both male and female, were keen to go for a group ride on a Sunday morning. 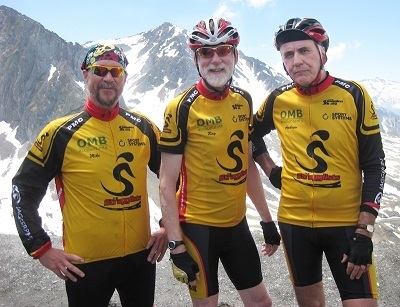 Subsequently the Stragglists were born and, to give the group an identity I designed a predominantly gold coloured jersey which would not only continue the Straggler colours but, very importantly for a road cyclist, the bright tones would be easily seen by other road users. We are delighted to have sponsorship for some of the cost of the jerseys from companies who have strong links with the Stragglers and who have given us support over the years. The picture shows Mike wearing a spray jacket, Ray wearing a short-sleeved jersey and shorts and Andrew wearing a long-sleeved winter jersey and shorts. Sleeveless gilets are also available. SIDI PHYSIO is a multi disciplinary clinic offering physiotherapy, Pilates, podiatry, chiropody and personal training, with a positive approach to wellbeing for all patients ranging from elite athletes to the non-exercising individual. Our Chartered Physiotherapists aim to speed up your recovery from injury by using the best evidence based techniques suited to your needs with customised rehabilitation programmes. Several Stragglists and Stragglers have visited Paul with various injuries and have been delighted with the treatment they have received. Anyone who has competed in running races will know Sport Systems as they specialize in the timing of many local and international events. Like Colin, Mark Thomas's help from the start has been invaluable. Find them at www.sportsystems.co.uk. Situated near to the centre of Kingston, Jaggerprint are a top quality printing company, turning around jobs at a very competitive price. They have recently come on board to help sponsor the winter jerseys. Find them at www.jaggerprint.co.uk. The Stragglists meet at 9:00am outside the Angel Inn which is situated by the war memorial at the junction of Angel Road and Portsmouth Road, Thames Ditton. If you have ever taken part in the Harry Hawkes 8 you'll know that it's on the opposite side to the Thames Ditton cricket clubhouse. 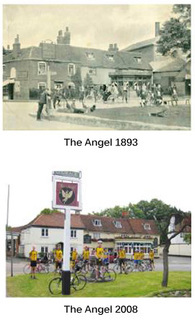 The Angel is a very historic landmark for cyclists and, considering quite a few club Sunday groups meet in the area, it's amazing that no one has used it as a meeting place. It was where none other than the Cycle Club of Great Britain used to meet from over one hundred years ago, so it's great that the Stragglists have rekindled the tradition. 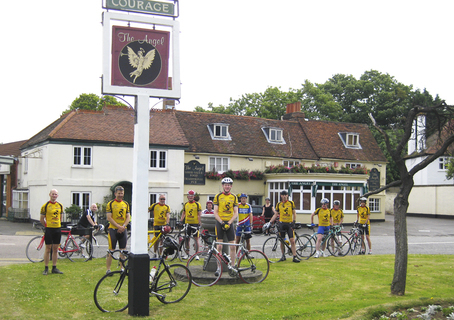 The pub was also a half way stopping off place for cyclists journeying between London and Ripley. The biggest concern voiced by those who are keen to join the group is that he or she won't be able to keep up and that they will be left stranded in some dark distant shire with no way of ever returning home. The idea of a Sunday ride is for everyone to enjoy the trip. With that in mind we have two groups; both following the same route but the first, easier paced group will leave at 9:00am sharp and the second will leave at about 9:05am. We ride throughout the year depending on weather conditions. If it's wet or icy you may find that the meeting place is deserted. Distances from the Angel and back are around 45 miles and slightly shorter during the winter months. Unless the weather turns unpleasant during the ride a coffee stop is always scheduled roughly half way along the route. So don't forget to bring some cash. The average speed of the slower group ranges from about 14.5 to 15.5 mph whilst the pursuing group will average speeds of 15.5 to 16mph but it all depends on the terrain covered. That 1mph gap can make the difference between a ride to remember with pleasure and a total nightmare. We now also have a 3rd group that is led by Mirella who covers routes of about 35 miles at an avarage speed of 13mph. These will be on designated dates and announced each month. Generally we head for the North Downs and Surrey Hills as the general qualities of this area are ideal for road cycling. Occasionally we head off in the other direction on a flatter route towards Windsor. You must be 18 years of age or accompanied by a guardian if you're under 18. Your bike should be of the road racing variety, properly maintained with slick tyres. The heavier the bike the harder you'll have to work. The wearing of helmets is essential for group rides and you should bear in mind that every cyclist in the group is responsible for his or her own safety. A spare inner tube (and repair patches are useful) with pump, tyre levers and multi tool should be carried. If a puncture or mechanical problem occurs the whole group stops whilst the repair is made. On days when the roads are wet it's useful to attach mudguards. They help to prevent spaying everyone behind – and the back of your jersey – with dirty water. Good quality clip-on guards are easy to fit. When group cycling we try as much as possible to 'draft' each other. Riding close to the back wheel of the cyclist in front is a huge help in cutting down wind resistance. It's a skill that, in time, you'll grow to love especially if you're getting tired. We also try to point out or call if obstacles appear and, because of the increased amount of potholes along the Surrey roads these days this is becoming a frequent courtesy given to following riders. Ascending hills does tend to string out a group. The fastest riders should stop at the top for the others to catch up. Sometimes a breakaway is great fun and a chase close to the end of a ride isn't unheard of but regrouping is essential once the testosterone junkies have had their fun. The most important aspect of any of our rides is that every participant comes away having had an enjoyable and beneficial time. If you have any comments that you would like to make, don't hesitate to bend my ear. The Stragglists have affiliated membership of British Cycling. If you think you fit the above conditions you are very welcome to try out a Sunday ride with us. If,after two rides, you would like to continue riding with the Stragglists and you are not a member of the Stragglers Running Club, you will be obliged to join. At the moment the annual fee is £10. Each week I will put together details of the previous week's ride, any news and events that may be coming up and what may be happening for the upcoming Sunday. Well, that's just about it. If there are any details that you are unsure about or you have a query about any of the above please email me and I shall attempt to give you an answer.